We’ve seen a heap of Live Termites surrounding the Gold Coast’s Palm Beach area. Termites are thirsty and the building and construction industry is thriving as builders and homeowners come together for a renovation rumble. There have been many cases where builders have luckily discovered live termites in wall cavities during the renovation. Every second street in Palm Beach seems to be a sea of tradesman utes as extensions and new builds keep rolling out. Today we treated a live termite infestation in Palm Beach using Termidor and a foaming agent. The treatment solution was used using the latest foaming machine. 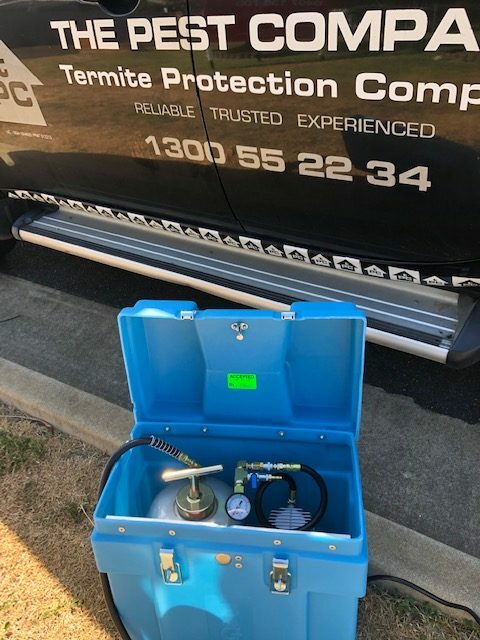 Pest Control technicians carrying out Termite treatments in areas like Palm Beach or any other area on the Gold Coast should be carrying out the treatments with maximum care for safety and minimum disturbance to the live active termites. Termites thrive in humid conditions like we have seen at the start of 2019. Once a Termite treatment has been carried out it’s time to leave the termites alone for at least 3 -4 weeks till such time a return visit will determine how effective the treatment was. There are at times complications where builders are renovating and remove wall sheeting and ceiling where they discover live termites, unfortunately this can hold up the renovation till the treatment has been completed. Once Termites have been eliminated from the Palm Beach property a Termite barrier or monitoring and baiting system can be installed to protect the property long term. It is best to have your builder work in with the Termite Barrier installers to ensure nothing is missed or disturbed during the entire process as timing is critical. Call TPC for Termite Inspections, Treatments and Protection in Palm Beach Queensland 1300 552234.